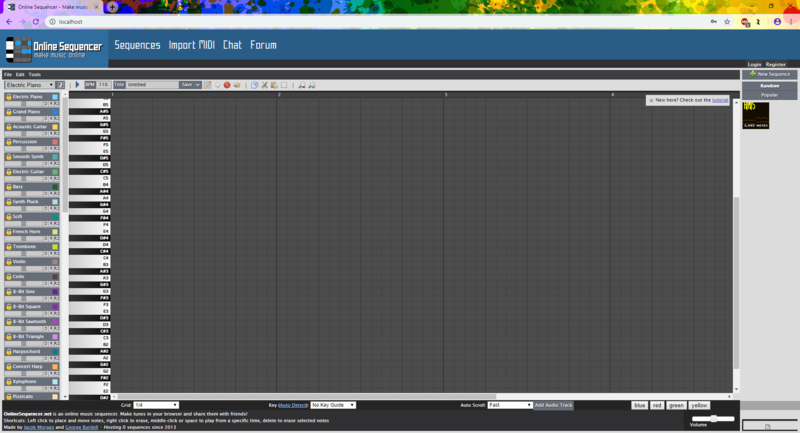 After four hours of work, I have managed to come up with a much better-looking UI layout for the program. I hope that you are able to implement it!! As you can see, there are a few new things. For one, there is a little bell icon on the upper right. This is to notify any replies either in the CHAT, or in the FORUM. I have removed the SEQUENCES, and the MEMBERS tab for both should be on the soon-to-come homepage, and the sequences created by other people OR the same guy are going to be just above the comment section, which is also in a new spot. There is a little Info sign in the right [i] . This is meant to tell how many likes a sequence has, the amount of views it currently has, AAAAND a custom description created by the composer which I hope will be added soon. It should also include links to inspirations/remixes of the song. Don't forget the new ABOUT page. Currently, there is a little description of the website just below the program. It uses up precious space, and I hope to move it over to a new tab. As for the grid length, song import, and so on, I think they should be put in a separate settings window similar to the chat. The settings can be accessed by a button located on the bottom left, lying on the black bar. If this seems really stupid to you, keep in mind: I'm thirteen. Most things we do are very stupid... soooo.... yeaaaahhh... K.
I hope you take my suggestion seriously, OS is my favorite website to mess around on. I just think there are a few weeds I think should be pulled from the garden. Why else would I waste so much time putting together a picture?! What about having the dropdown menus be semi-transparent? it'd be cool if you could create os playlists. Also d, you should use a more appealing font. The one ableton uses is very aesthetically pleasing.